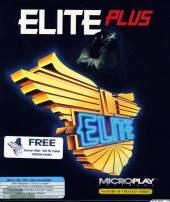 This is a VGA re-make of Bell and Braben's space trading flight simulator, Elite. It is an updated conversion of the original that features new graphics and sounds/music. The novella included with this package, 'Imprint' by Andy Redman, which formed the latter part of the manual is different from the one that came with the original Elite releases. It was coded entirely in assembly language by Chris Sawyer, who later wrote RollerCoaster Tycoon. It has a ninth galaxy that can only be reached by hyperspacing into Witch Space. In 2000, the game was made freeware.